SqlBackupAndFtp will do this for you! Does all this for FREE! To get more information read How to Restore SQL Server Backups. What if I have full, differential and transaction log backups? 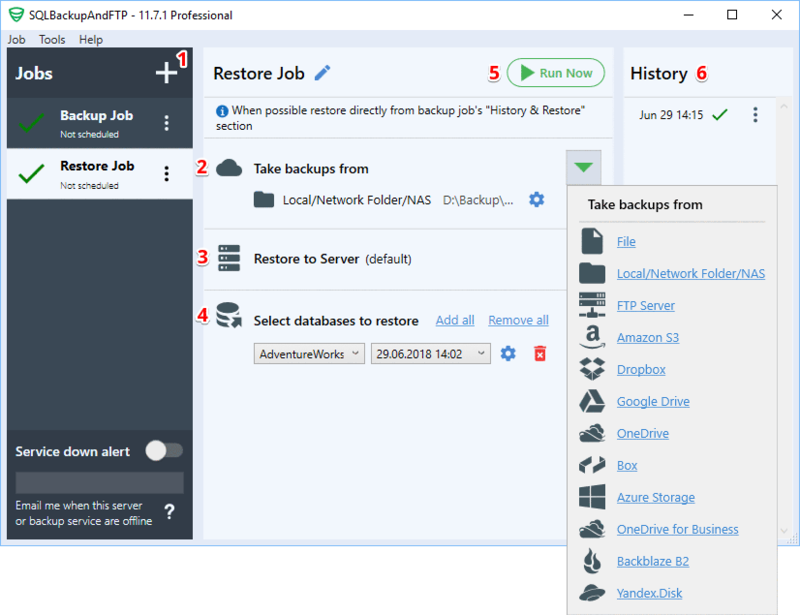 No problem, you can choose any of them as a recovery point and SqlBackupAndFtp will handle all of them properly: first the full backup will be recovered, then the last differential backup, and then all transaction log backups up to the selected recovery point. Do you overwrite the files when restoring to another database? When restoring a backup from database X to database Y, we use "MOVE" option so Y files get overwritten. Most common errors are "The media family on device .. is incorrectly formed", "RESTORE HEADERONLY is terminating abnormally", "The backup of the system database on device .. cannot be restored because it was created by a different version of the server" - they all occur when you try to restore to an older SQL server. You can NOT restore backups from a newer SQL version to an older - the formats of (Microsoft) backup files are different. Do you guarantee the safety of the data? No (nobody would). Under no circumstances we accept any responsibility for the use and performance of this program. It is provided to you "AS IS" - use at you own risk (see Terms of Service). In general, database backup and restore operations should only be handled by a person who knows what he is doing. It is very easy to overwrite an existing database and loose the data. If in any doubt - don't do it yourself, find a professional that could help. See our FAQ on Licensing for answers. Free users receive support through the forum. If you have a valid full-service subscription you can get email support from our team.